Study Shows People Are Clueless About Energy Savings – Here's What Actually Works. Quick, name one of the best things you can do to save energy at home. If you said “turning off the lights,” you’d be wrong. But you are not alone, most Americans say the same thing. A new survey shows most people have misconceptions about what works best to save energy. Keeping lights off isn’t a bad idea in itself, but it has significantly less impact than swapping out the bulbs for more energy-efficient ones, says Shahzeen Attari, who published a paper on the survey. In some cases, leaving energy-efficient lights on may actually be more effective: according the the Department of Energy, the lifespan of compact fluorescents, or CFLs, is decreased by being frequently switched off and on. If you are leaving the room for less than 15 minutes, it is actually more efficient to keep a CFL on for that time. 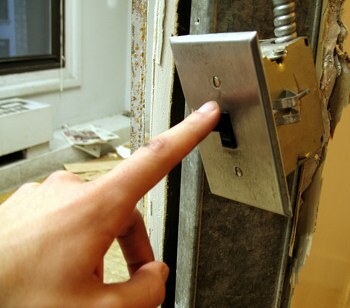 If you will be gone for more than 15 minutes, however, it is more efficient to switch the light off. Survey participants were asked an open-ended question on what they thought was the single most effective thing they could do to conserve energy in their lives. Attari put the most common responses into two main categories: curtailment, meaning not doing something as often, and efficiency, meaning making their energy use itself less wasteful. The majority of the participants’ answers, such as turning off lights, changing thermostat settings and unplugging appliances, fell into the curtailment category. These actions are certainly helpful, but even more effective are efficiency changes, such as using CFL light bulbs, buying Energy Star appliances, and driving a hybrid car. In other words, it’s better to buy new, efficient equipment than to sparingly use older, energy-hungry products. Perceptions were often inaccurate. For example, many thought central air conditioning uses only 1.3 times the energy of a single room AC unit, when it actually uses around 3.5 times as much energy. 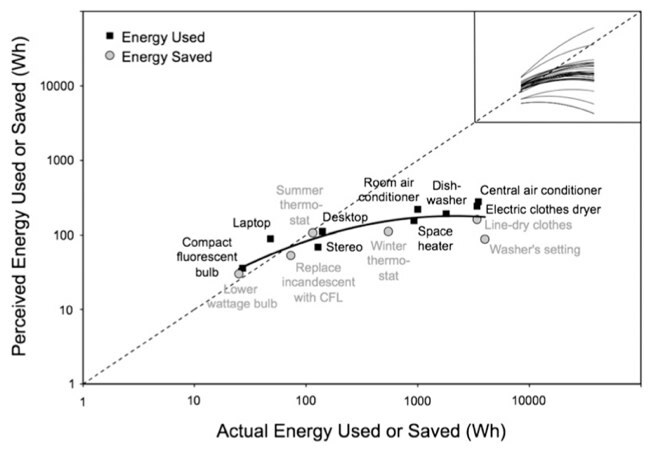 Many consumers don’t have a good concept of how much energy per hour a given appliance uses. People understand how much energy goes into a light bulb per hour, Attari said, but not the equivalent of how many light bulbs per hour are used by a dishwasher. Attari also attributed a psychological phenomenon called single action bias, in which a person does one or two things to address a problem and considers themselves off the hook, as an explanation of why some believe they do more to conserve energy than they really are. When those one or two things fall into curtailment, like turning off the lights, instead of efficiency, like replacing the washer, they help less than some perceive. Psychology aside, if each of us were to do just one or two things to save energy, Attari recommends they be replacing light bulbs with CFL bulbs and weatherizing our homes. Generalized recommendations can be muddy, however, as each person’s energy usage is different. This means that for some, the most effective thing might be to use public transportation instead of driving, or to line-dry clothes after washing them.